In this spirit, it is with great pleasure that I am attaching a very thoughtful and clarifying addition to the growing literature describing Boyd’s theories. This link will take you to a masters thesis written by Major Paul D. Tremblay Jr, (aka P.J. Tremblay)** USMC as part of his study in the Command and Staff College of the U.S. Marine Corps. In my opinion, Tremblay has produced precisely the kind idea expansion that Colonel Boyd was trying to inspire with his Discourse. ** Caveat emptor: PJ Tremblay is a close friend. Major Tremblay did not know Colonel Boyd but has been aware of his briefings since he was a 2nd Lieutenant at the Marine Corps Basic School. He is the only officer I know who has studied and applied Colonel Boyd’s ideas in a premeditated way in designing and the leading a combat operation (Operation Eastern Storm in Kajaki Sofla, Helmand Province Afghanistan, 2011 -- Major Tremblay's application of Boyd's ideas can be seen throughout his in end of tour report, but are especially notable in Topic F which contains his description of Eastern Storm) This multi-pronged reinforced company level attack on the Taliban was a stunning success and based on radio intercepts, it became clear he penetrated his adversary’s OODA loops and collapsed the opposing units into confusion and disorder, exactly like Boyd predicted. His thesis does not discuss this operation. 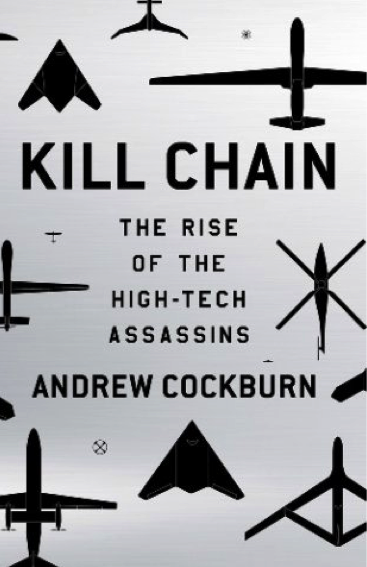 The following is an excerpt from Andrew Cockburn's new book, Kill Chain: The Rise of the High-Tech Assassins Henry Holt, 2015). The Richard M. Helms Award dinner, held annually at a major Washington hotel, is among the highlights of the intelligence community’s social calendar. Hosted by the CIA Officers Memorial Foundation, the event raises and distributes money to aid families of officers killed in action, whose sacrifice is commemorated in the rows of stars carved into the wall of the foyer at agency headquarters in Langley, Virginia. The venue for the 2011 event, held on March 30, was the Ritz-Carlton Hotel, Pentagon City, and as usual it attracted hundreds of intelligence luminaries, current and former. Joining them were senior executives of various defense corporations—Lockheed, SAIC, Booz Allen, General Atomics, and others—who had generously sponsored tables at the event. There was much to celebrate. President Barack Obama, who had run a quasi-antiwar liberal campaign for the White House, had embraced the assassination program and had decreed, “the CIA gets what it wants.” Intelligence budgets were maintaining the steep upward curve that had started in 2001, and while all agencies were benefiting,none had done as well as the CIA. At just under $15 billion, the agency’s budget had climbed by 56 percent just since 2004. In the decade since 9/11, the CIA had been regularly blighted by scandal—revelations of torture, renditions, secret “black site” prisons, bogus intelligence justifying the invasion of Iraq, ignored signs of the impending 9/11 attacks—but such unwholesome realities found no echo in this comradely gathering. Even George Tenet, the CIA director who had presided over all of the aforementioned scandals, was greeted with heartfelt affection by erstwhile colleagues as he, along with almost every other living former CIA director, stood to be introduced by Master of Ceremonies John McLaughlin, a former deputy director himself deeply complicit in the Iraq fiasco. Each, with the exception of Stansfield Turner (still bitterly resented for downsizing the agency post-Vietnam), received ringing applause, but none more than the night’s honoree, former CIA director and then-current secretary of defense Robert M. Gates. Although Gates had left the CIA eighteen years before, he was very much the father figure of the institution and a mentor to the intelligence chieftains, active and retired, who cheered him so fervently that night at the Ritz-Carlton. He had climbed through the ranks of the national security bureaucracy with a ruthless determination all too evident to those around him. Ray McGovern, his supervisor in his first agency post, as an analyst with the intelligence directorate’s soviet foreign policy branch, recalls writing in an efficiency reportthat the young man’s “evident and all-consuming ambition is a disruptive influence in the branch.” There had come a brief check on his rise to power when his involvement in the Iran-Contra imbroglio cratered an initial attempt to win confirmation as CIA director, but success came a few years later, in 1991, despite vehement protests from former colleagues over his persistent willingness to sacrifice analytic objectivity to the political convenience of his masters. Gates’s successful 1991 confirmation as CIA chief owed much, so colleagues assessed, to diligent work behind the scenes on the part of the Senate Intelligence Committee’s staff director, George Tenet. In 1993, Tenet moved on to be director for intelligence programs on the Clinton White House national security staff, in which capacity he came to know and esteem John Brennan, a midlevel and hitherto undistinguished CIA analyst assigned to brief White House staffers. Tenet liked Brennan so much that when he himself moved to the CIA as deputy director in 1995, he had the briefer appointed station chief in Riyadh, an important position normally reserved for someone with actual operational experience. In this sensitive post Brennan worked tirelessly to avoid irritating his Saudi hosts, showing reluctance, for example, to press them for Osama bin Laden’s biographical details when asked to do so by the bin Laden unit back at headquarters. Brennan returned to Washington in 1999 under Tenet’s patronage, initially as his chief of staff and then as CIA executive director, and by 2003 he had transitioned to the burgeoning field of intelligence fusion bureaucracy. The notion that the way to avert miscommunication between intelligence bureaucracies was to create yet more layers of bureaucracy was popular in Washington in the aftermath of 9/11. One concrete expression of this trend was the Terrorist Threat Integration Center, known as T-TIC and then renamed the National Counter Terrorism Center a year later. Brennan was the first head of T-TIC, distinguishing himself in catering to the abiding paranoia of the times. On one occasion, notorious within the community, he circulated an urgent report that al-Qaeda was encrypting targeting information for terrorist attacks in the broadcasts of the al-Jazeera TV network, thereby generating an “orange” alert and the cancellation of dozens of international flights. The initiative was greeted with malicious amusement over at the CIA’s own Counterterrorism Center, whose chief at the time, José Rodríguez, later opined that Brennan had been trying to build up his profile with higher authority. “Brennan was a major factor in keeping [the al-Jazeera/al-Qaeda story] alive. We thought it was ridiculous,” he told a reporter. “My own view is he saw this, he took this, as a way to have relevance, to take something to the White House.” Tellingly, an Obama White House spokesman later excused Brennan’s behavior on the grounds that though he had circulated the report, he hadn’t believed it himself. Exiting government service in 2005, Brennan spent the next three years heading The Analysis Corporation, an obscure but profitable intelligence contractor engaged in preparing terrorist watch lists for the government, work for which he was paid $763,000 in 2008. Among the useful relationships he had cultivated over the years was well-connected Democrat Anthony Lake, a former national security adviser to Bill Clinton, who recommended him to presidential candidate Barack Obama. Meeting for the first time shortly after Obama’s election victory, the pair bonded immediately, with Obama “finishing Brennan’s sentences,” by one account. Among their points of wholehearted agreement was the merit of a surgical approach to terrorist threats, the “need to target the metastasizing disease without destroying the surrounding tissue,” as Brennan put it, for which drones and their Hellfire missiles seemed the ideal tools. Obama was initially balked in his desire to make Brennan CIA director because of the latter’s all-too-close association with the agency’s torture program, so instead the new president made him his assistant for counterterrorism and homeland security, with an office down the hall from the Oval Office. Two years into the administration, everyone in the Ritz-Carlton ballroom knew that the bulky Irishman was the most powerful man in U.S. intelligence as the custodian of the president’s kill list, on which the chief executive and former constitutional law professor insisted on reserving the last word, making his final selections for execution at regularly scheduled Tuesday afternoon meetings. “You know, our president has his brutal side,” a CIA source cognizant of Obama’s involvement observed to me at the time. Now, along with the other six hundred diners at the Helms dinner, Brennan listened attentively as Gates rose to accept the coveted award for “exemplary service to the nation and the Central Intelligence Agency.” After paying due tribute to previous honorees as well as his pride in being part of the CIA “family,” Gates spoke movingly of a recent and particularly tragic instance of CIA sacrifice, the seven men and women killed by a suicide bomber at an agency base, Forward Operating Base Chapman, in Khost, Afghanistan, in 2009. All present bowed their heads in silent tribute. Excerpted from Andrew Cockburn's new book, Kill Chain: The Rise of the High-Tech Assassins Henry Holt, 2015). Reprinted here with permission from the author.